Pressburger King (SuperTransmutingKing): King which definitively takes up the nature of the checking piece (and thus loses his royal status). Spiralspringer: Moves as Nightrider ((1,2) Rider – operates along straight lines with squares lying a Knight`s move away from each other), but spirally along the orthogonal line – a1-c2-a3-c4-a5-c6-a7-c8 or a1-b3-c1- … -h3, and also via a1-b3-a5-b7 or a1-c2-e1-g2. Bishop-Lion(BL): Moves along Bishop lines over another unit of either color to any square beyond that unit. A capture may be made on arrival, but the hurdle is not affected. Will SSa1 move via a1-b3-c1-d3-e1 lines also? Sorry, The moves of SS are a little confusing. How SS moving to h5 checks the white king h8? Through which route? 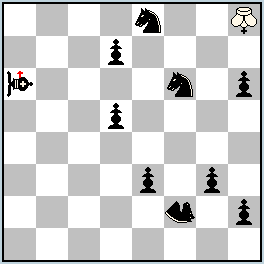 SSf2-h3-f4-h5; white King is on g7, the next route would be SSh5-g7-f5-e7…. And, to your first question, yes, it moves also a1-b3-c1-d3-e1.